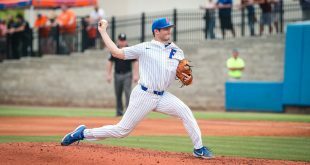 Coming off an extra-inning thriller against Jacksonville University, the Gator baseball team s looked to build upon their three-game win streak against the University of Central Florida Knights on Wednesday night in Gainesville. But in a back and forth contest, the fifth ranked Gators fell 12-9 to the Knights, the fifth consecutive win for UCF over Florida. 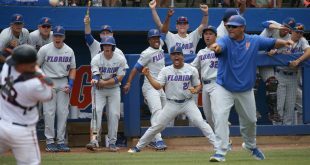 The Gators got off to a quick start against UCF, but soon after fell into a slump at bat. Florida would regain their hot streak at the plate with a grand slam from sophomore Kirby McMullen in the bottom of the fifth inning. 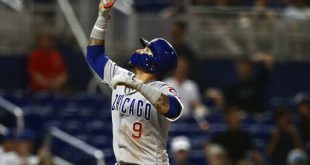 However, the fatal flaw for the Gators was their ninth inning mistakes. UCF quickly capitalized on the opportunity to score multiple ninth inning runs. The #Gators lost a tough one on Wednesday, falling to UCF in a four-hour plus marathon game. Throughout the season, Florida freshmen have become some of the biggest play makers and contributors for the Gators. The Florida starting line up against the Knights contained five freshmen, including starting pitcher Ben Specht. Three other freshman pitchers, Nick Pogue, Hunter Ruth, and Kris Armstrong would also take the mound for the Gators. Specht got his first start of the season on the mound for the Gators; in three innings he gave up five hits and three earned runs with three strikeouts. At the plate, freshman Kendrick Calilao continued to make his presence known. In the first inning, Calilao hit a triple that plated two runs. He’s now hit in five of his last six games and he leads the Gators with a .355 batting average. Right fielder Jacob Young hand a standout performance for the Gators. 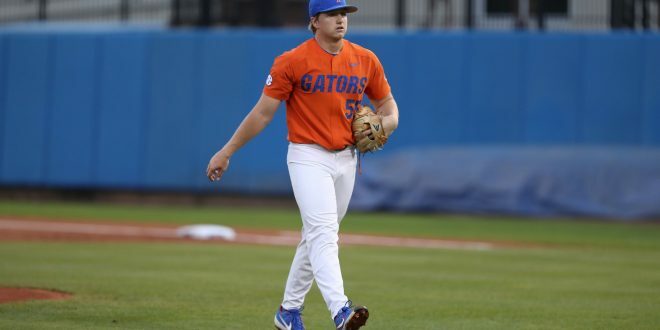 Young, filling in for Wil Dalton who could not play because of having to sit out a game due to being ejected in UF’s win over Jacksonville on Tuesday, was 2 for 6 at the plate, including a single to center field that would set up a run for the Gators in the first inning. Gator coach Kevin O’Sullivan commented on Young’s potential and his impact against the Knights. After scoring three runs in the first inning, the Gators would go scoreless until the fifth inning. Meanwhile, the Knights started to gain momentum at the plate beginning with a run in the second inning that cut the Gators’ lead to 3-1. The Knights would go on to score in six consecutive innings. In the top of the fifth inning, the Knights scored three runs to take a 7-3 lead. However, the Gators responded with a rally of their own. With the bases loaded in the bottom of the fifth, junior Kirby McMullen hit a grand slam that would give the Gators the lead, 8-7. But Gator pitching could not hold down UCF on offense. After tying the game at 8-8 in the top of the sixth, UCF went ahead in the seventh 9-8 on a solo homer by infielder Brandon Hernandez. And UCF busted the game open in the top of the ninth. Two hits, a walk, an error and a steal of home highlighted the rally for UCF. 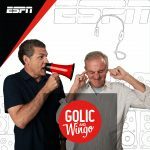 Coach O’Sullivan discussed the flaws that can come with having a young team. 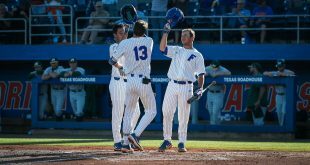 The Gators look ahead to their weekend series against the Winthrop Eagles. The first pitch is set for 6:30 p.m. on Friday. 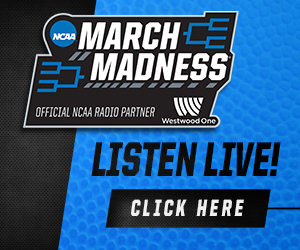 Additionally, you can catch live coverage of this weekend’s series on 98.1 FM/850 AM.